Out of a 2-time Zabeel winning mare that has two foals to race for two winners. This filly has the OAKS written all over her! From an Oaks winning family that includes DIZELLE and PINOT! 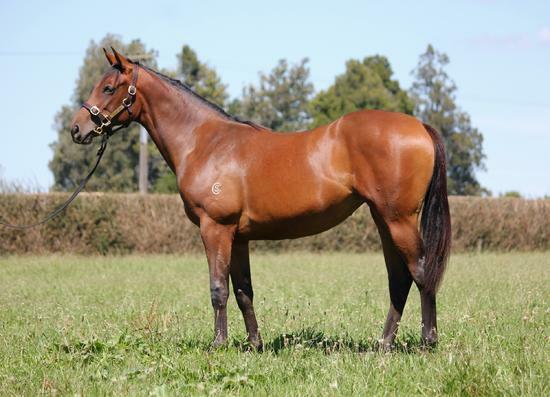 Lot 243 - Tav x Harmony - NZ Karaka 2018 FINAL PDS from Dalziel Racing on Vimeo. Perfect Harmonee (g. by Nadeem). 5 wins at 1200m, 1350m, NZ$88,275, to 2017-18, Wanganui JC Dave Hoskin Carriers H., 2d Wanganui Guineas, L, WRC Hanley Formula Championship H., Hiremaster H., Wanganui JC Wanganui Steelformers H., 3d Manawatu RC McEntee Event Hire 2YO H., Levin RC Courtesy Ford 2YO H.
Loch Ness (f. by Keeper). 2 wins at 1350m in 2016-17, Wanganui JC NZB Insurance Pearl Series H., Wanganui Steelformers S., 3d Wanganui JC NZB Insurance Pearl Series H.
Keepin Harmonee (g. by Keeper). Placed in 2018-19 in NZ. Blue Lion (Zabeel). 6 wins from 1200m to 1800m, A$90,945, S$138,217, BRC Mount Alvernia College H., Singapore TC Benchmark 67 H.-twice, Class 4 H., 2d Singapore TC Yew Tee Classic, L, BRC Garrards Horse & Hound H., 3d Qld Tatt's RC Recognition S., L, ATC Wollongong Dental Ceramics H., SCTC Coastline BMW X1 H.
Harmony. 2 wins. See above. Picablu (Piccolo). 14 wins from 900m to 1600m, A$392,739, BTC Northern City Finance H., QTC Ormiston College H., Mighty Grey Welter H., 3d Qld Tatt's RC Recognition S., L.
SUBSCRIBE - VENGEANCE OF RAIN (H.K.) (Zabeel). Horse of the Year in Hong Kong in 2006-07. Champion Stayer in Hong Kong 2004-05 & 2006-07 & in UAE in 2006-07. 10 wins-1 at 2-from 1200m to 2400m, A$64,000, HK$46,965,500, 11,040,000Dhs in Aust., HK and U.A.E, HKJC Audemars Piguet Queen Elizabeth II Cup, Gr.1, Cathay Pacific Hong Kong Cup, Gr.1, Nad al Sheba Dubai Sheema Classic S., Gr.1, MRC Chairman's S., L, HKJC Cathay Pacific International Cup Trial, L, Centenary Vase, L, Mercedes-Benz Hong Kong Derby, L, Hong Kong Gold Cup, L, Hong Kong Champions & Chater Cup, L, Fairy King Prawn H., 2d HKJC Audemars Piguet Queen Elizabeth II Cup, Gr.1, Hong Kong Champions & Chater Cup, L, 3d Cathay Pacific Hong Kong Cup, Gr.1, VRC Talindert S., L.
PINOT (Pierro). 3 wins from 1800m to 2500m, A$733,275, in 2017-18, VRC Oaks, Gr.1, MRC Ethereal S., Gr.3, VRC Kennedy Oaks Trial P.
DIZLAGO (Encosta de Lago). 2 wins-1 at 2-at 1400m, 2000m, A$85,163, MRC Ethereal S., L, Shoobra 2YO P. Producer. OLD NORTH (Lonhro). 4 wins from 1350m to 2000m, A$316,990, to 2017-18, ATC Tulloch S., Gr.2, BRC Makers Mark H., ATC All Too Hard at Vinery P., Cafe Culture & Insitu H., 2d ATC Frank Packer P., Gr.3, 3d ATC Octagonal H., NSW Tatt's RC National Jockeys Trust H., 4th ATC Shannon S., Gr.2, Phar Lap S., Gr.2, GCTC AD Hollindale S., Gr.2. CABLE - WELL DONE (Mac.) (Last Tycoon). 8 wins-2 at 2-at 1000m, 1200m, A$93,540, M$1,666,550 in Aust. and Macau, SAJC Jansz S., Gr.3, VATC Highways Tabaret H., 2d VATC Out of Danger 2YO H., Macau Airdrieonians H.
Villa Bled (Danehill). 4 wins from 1200m to 1600m, A$290,600, AJC Profix Sprint H., 3d AJC Emancipation S., Gr.2, Qld Tatt's RC Winter S., Gr.2, BTC Labour Day Cup, Gr.3. Producer. PLATINUM COMMAND (Red Giant). 10 wins from 1400m to 1800m, NZ$311,842, to 2018-19, CJC Winter Cup, Gr.3, WRC Whyte H., IRT North Island H., CJC Christchurch Casino NZ Cup Trial H., 2d CJC Winter Cup, Gr.3, Marton JC Metric Mile, Gr.3. EVASION (Semipalatinsk). 6 wins-2 at 2-from 1200m to 3200m, A$105,260, Queensland Cup, L, BATC Neighbours Rest S.H., QTC Denmac Louisville H., Baileys Irish Cream Novice H., El Alamein H., Camahuge H., 3d BATC Labour Day Cup, L.
Bluetinsk (Semipalatinsk). 7 wins from 1200m to 2100m, A$75,370, TRC Charlie Goggin H., Eastlands Quality H., TTC Caroma H., Carlton H., 3d TTC Launceston Cup, Gr.3, Tasmanian St Leger, L.
Russian Trader (Semipalatinsk). 4 wins-1 at 2-from 1000m to 2000m, A$78,790, VRC Great Western H., BTC AIW 5 Star H., 2d VATC Dairy Farmers Milk H., So Called H., 3d VRC St Leger, Gr.3, MVRC Qantas Club H.
KINGS HONOR - BON AMIE (Sing.) (Fairy King). 7 wins from 1200m to 1800m, NZ$32,500, S$730,513, Singapore TC Patrons' Bowl, L, Jumbo Jet Trophy, L, 2d Matamata RC Slipper S., L, Singapore TC Lion City Cup, L-twice, 3d Wellington Guineas, Gr.2. Satay (Keeper). 3 wins at 1400m, 1600m, 2d ARC Dunstan Feeds Championship Qualifier, 3d ARC Champion Stakes Prelude, L.
Catlagh (Catrail). 2 wins at 1000m, 1200m, SAJC Hero Wind H., Deutscher Menzies Fine Art 3YO H., 2d SAJC Golden Circle 2YO H., 3d SAJC KPMG S., L.Died at 3.